I have used technology in the Art classroom for years and have facilitated it's use across the curriculum for many years now. The iPad is a natural progression from the portable laptop classroom. However teaching approaches need to be modified in order to best utilise this device. As with any new technology, the teacher must foster an environment that allows freedom to explore, but also set clear aims and expectations, as well as providing time to feedback and evaluate progress. Not just an Internet browser Many of the new Internet technologies can be enhanced using the iPad. Blogging in the classroom becomes a large collaborative literacy activity. The ability to share information between iPads and the mobility of the device enabling focused sharing sessions, encouraging focused communication. Managing and monitoring classroom learning Current trends are moving away from managed information in classrooms towards student lead investigation, the teacher becomes the facilitator of this process. This calls for new classroom management techniques and assessment criteria. The Agile space This is a term keyed for the new portable device revolution, it is ICT anywhere anytime. No hardware restrictions, greatly reduced technical dependence. A more natural way to access information over over WiFi network. Video, image and text at your fingertips. The touch interface brings an immediacy to the device that makes surfing intuitive and creating images a breeze. 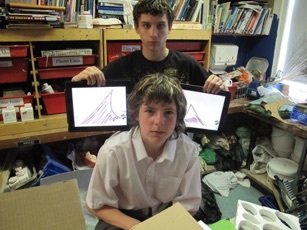 I have used a stylus and tablet in the art classroom, but students found the separation between input point and screen too difficult and unnatural to motivate them to pursue this technique. My students take to the ipad intuitively! Access Apple has made some outstanding built in access options within the OS setup. There are also some outstanding assistive apps available. I have purchased the App "ProLoQuo2Go" for a student with Cerebral Palsy, check it out on youtube! I have used technology in the Art classroom for years and have facilitated it's use across the curriculum for many years now. The iPad is a natural progression from the portable laptop classroom. However teaching approaches need to be modified in order to best utilise this device. As with any new technology, the teacher must foster an environment that allows freedom to explore, but also set clear aims and expectations, as well as providing time to feedback and evaluate progress. Many of the new Internet technologies can be enhanced using the iPad. Blogging in the classroom becomes a large collaborative literacy activity. The ability to share information between iPads and the mobility of the device enabling focused sharing sessions, encouraging focused communication. Current trends are moving away from managed information in classrooms towards student lead investigation, the teacher becomes the facilitator of this process. This calls for new classroom management techniques and assessment criteria. This is a term keyed for the new portable device revolution, it is ICT anywhere anytime. No hardware restrictions, greatly reduced technical dependence. A more natural way to access information over over WiFi network. Video, image and text at your fingertips. The touch interface brings an immediacy to the device that makes surfing intuitive and creating images a breeze. 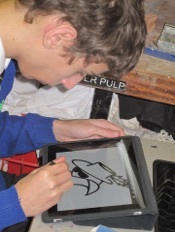 I have used a stylus and tablet in the art classroom, but students found the separation between input point and screen too difficult and unnatural to motivate them to pursue this technique. My students take to the ipad intuitively! Apple has made some outstanding built in access options within the OS setup. There are also some outstanding assistive apps available. I have purchased the App "ProLoQuo2Go" for a student with Cerebral Palsy, check it out on youtube!